Rep. Ilhan Omar (D., Minn.) used some fuzzy math on Thursday while making a point on pay gaps at a hearing about raising the minimum wage. Omar spoke with a Missouri McDonald's shift manager named Terrence Wise at a House Education and Labor Committee hearing pushing for a federal minimum wage raise to $15 an hour. "So the CEO of McDonald's [Steve Easterbrook] gets paid $21.8 million," she said. "Can you share with us what someone in your position at McDonald's gets paid annually?" "Not that much," Wise said, drawing laughter. "I make $11 an hour at my job, currently." "So the median pay for a McDonald's worker was $7,000 in 2017, and that is the pay gap between the CEO that's making $21.8 [million] to the $7,000 that a worker who has put in 40 hours a day[sic] gets paid," Omar said. "To me, that just morally does not sit well." Omar meant to say 40 hours a week, as there are only 24 hours in a day. However, if a full-time employee worked for $11 an hour at 40 hours a week, 50 weeks a year, he or she would make about $22,000 a year before taxes. The average hourly rate for a McDonald's employee is about $9 an hour, according to the company, which comes out to roughly $18,000 a year for a full-time worker before taxes. 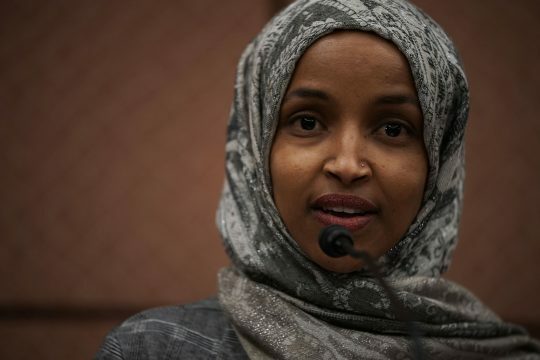 Omar tweeted out a video clip of the exchange and called the pay gap a "moral outrage," calling for a $15 minimum wage "so that no one is paid a poverty wage." McDonald's, however, uses a heavy amount of part-time employees and has a global workforce, both factors that drive down the median wage. According to the Associated Press, as flagged on Twitter by reporter Jeryl Bier, McDonald's defines a median employee "as a part-time hourly restaurant crew member in Poland:"
McDonald’s defines a median employee as a part-time hourly restaurant crew member in Poland, where wages are lower than in the U.S. and it didn’t use any of the exclusions allowed. Companies, like McDonald’s, with global workforces and that rely on part-time or temporary employees tend to have higher pay gaps. Easterbrook’s pay is also based on company performance, and the company’s value grew $36 billion last year. This entry was posted in Issues and tagged Ilhan Omar, McDonald's, Minimum Wage. Bookmark the permalink.